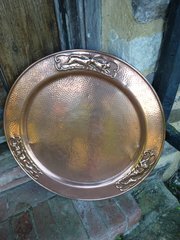 Lovely Arts & Crafts copper tray with pierced gallery and a fish and shell decoration. Stamped NEWLYN. It measures 49cms in length and 26cms wide with a depth of 5cms at he handles. Offered in good condition and has only been lightly cleaned but some marks remain in certain light which would probably move with further cleaning. 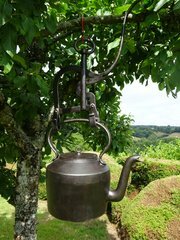 Lovely Victorian cast iron kettle with its pouring jack. The kettle. No 6 holds 6 quarts and was made by J & J Siddons of Hill Top, West Bromwich. It measures 34cms high and has a diameter of 22cms. Both are offered in a very good condition having been cleaned and waxed and the kettle holds water. Very heavy item! Would be sent via courier or collected. 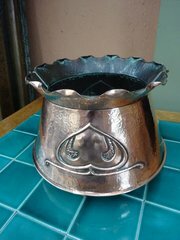 Pretty Arts & Crafts copper jardinière by J & F Pool of Hayle in Cornwall. This planter has the heart decoration on two sides and the seems on two sides. It stands 16cms high and has a maximum diameter of 24cms. The internal opening is 15cms. Offered in a good clean condition with just minor dings. Rare Arts & Crafts copper letter box made by J & F Pool of Hayle in Cornwall. Lovely decorative items with flowers to all corners. It measures 21cms in width and 10cms in height. The opening for letters is 13cms x 3cms. Not huge for today's mail but great for stopping junk mail! The condition is good and original. 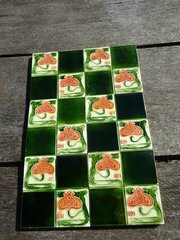 Lovely set of six Arts & Crafts tiles with a quarter design of flowers and plain green. Offered in .condition with just one having a small chip to reverse as shown They measure 15cms square or 6 inches. Unusual Arts & Crafts charger with three panels depicting different scenes of a hare hunt. One is of the hares, the second of the hounds and the third of the huntsman with a gun. Most probably made by J & F Pool of Hayle in Cornwall. offered in good condition with a diameter of 60cms. Would make a nice tray table and I could find a base for it if desired. Arts & Crafts Armchair with leather seat. 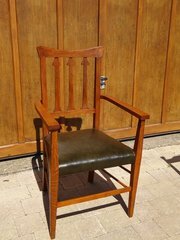 Stylish Arts & Crafts desk chair in oak with a newly upholstered green leather seat and delightful spades to back. Offered in excellent condition having been stripped and re polished. Height 100cms. Width at front of arms 58cms, Depth 48cms. Seat height 45cms. Arm height 69cms. 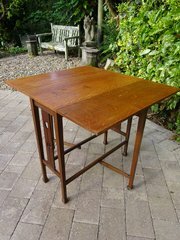 Arts & Crafts oak drop leaf table with tulip piercings to both ends typical of those retailed by Liberty Height 72cms. When closed the top measures 76cms x 37cms and when open the top is 86cms x 37cms making it perfect for a small tea table. 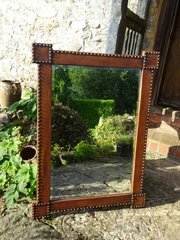 Offered in good original condition with a nice colour however there are some marks to top and a very tiny split to one edge. 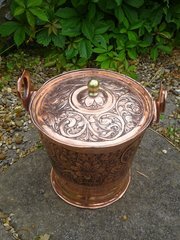 Stunning and very rare large copper lidded bucket with handles unique to the Keswick school of Industrial Arts. 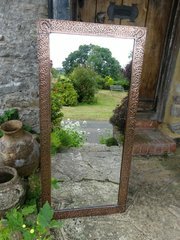 Superb quality repousse work which is different on both sides with various designs of scrolled acanthus leaves. It measures 40cms to the top of the lid at the brass finial. The maximum width is 39cms. Offered in good condition with just some dings at rim and base as to be expected.